A Global History of Architecture 2 Edition Praise for the First Edition "Because of its exceptionally wide perspective, even architectural historians who do not teach general survey courses are likely to enjoy and appreciate it." —Annali d'architettura "Not only does A Global History of Architecture own the territory (of world architecture), it pulls off this audacious task with panache, intelligence, and—for the most part—grace." —Journal of the Society of Architectural Historians Revised and updated—the compelling history of the world's great architectural achievements Organized along a global timeline, A Global History of Architecture, Second Edition has been updated and revised throughout to reflect current scholarship. Spanning from 3,500 b.c.e. to the present, this unique guide is written by an all-star team of architectural experts in their fields who emphasize the connections, contrasts, and influences of architectural movements throughout history. The architectural history of the world comes to life through a unified framework for interpreting and understanding architecture, supplemented by rich drawings from the renowned Frank Ching, as well as brilliant photographs. 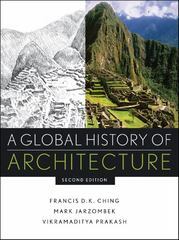 This new Second Edition: Delivers more coverage of non-Western areas, particularly Africa, South Asia, South East Asia, and Pre-Columbian America Is completely re-designed with full-color illustrations throughout Incorporates additional drawings by Professor Ching, including new maps with more information and color Meets the requirements set by the National Architectural Accrediting Board (NAAB) for "non-Western" architecture in history education. Offers new connections to a companion Web site, including Google EarthTM coordinates for ease of finding sites. Architecture and art enthusiasts will find A Global History of Architecture, Second Edition perpetually at their fingertips.